§ 252D.16A Income withholding order — child support recovery unit. 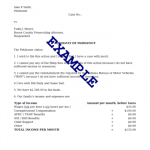 § 252D.17 Notice to payor of income — duties and liability — criminal penalty. § 252D.18A Multiple income withholding orders — amounts withheld by payor. § 252D.19A Disparity between order and pay dates — not delinquent. § 252D.23 Filing of withholding order — order effective as district court order. § 252D.30 Ex parte order — provisions for medical support.